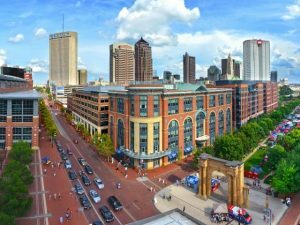 Event Description: An attractive site for a corporate team building event, the Arena District truly has something for everyone. Once the site of a state penitentiary, the shiny new Columbus Arena District is an exciting redevelopment area featuring brick streets and sidewalks, a mix of offices, restaurants, bars, apartments and condominiums, and the $160 million Nationwide Arena, home of the National Hockey League’s Columbus Blue Jackets. Nightlife is wide and varied, with restaurants like Buca di Beppo, traditional pubs like O’Shaughnessy’s Public House, and breweries like Gordon Biersch. During your corporate team building treasure hunt… expect to to see an old advertisement high on brick back ally; a giant statue of the city’s namesake; a full-size replica of the Santa Maria; statues depicting a Native American myth, and many other surprises. See all of our Columbus corporate team building events.